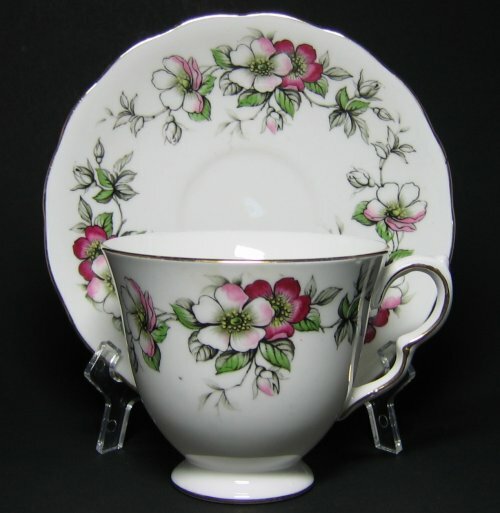 Vintage Queen Anne Tea Cup and Saucer - Pink Apple Blossoms! FABULOUS pink apple blossoms herald spring! Lovely Queen Anne set. 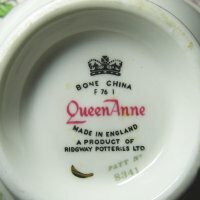 The backstamp is Queen Anne in red, Made in England, A product of Rigeway Potteries Ltd. Pat No. 8341. 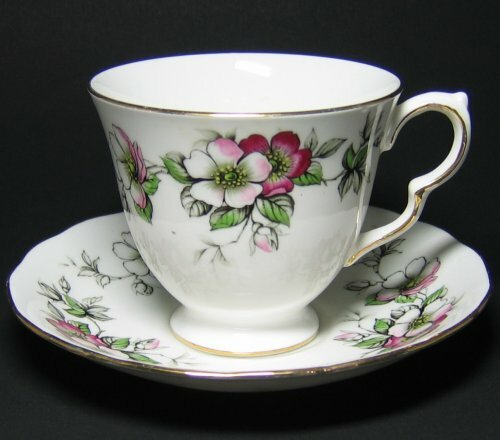 The cup is footed and has two irregularies - one is an indent which looks like a flea bite, but is actually painted and trimmed in gold. The second irregularity is what looks like a flea bite near the rim, although this is also glazed and painted. The cup measures 3" high and 3 1/4" wide. The saucer measures 5 1/2" wide with a slightly scalloped edge.